How Do You Clean Your Solar Panels? Option 1: Don’t clean them at all! What are the best options for solar panel cleaning? If you are looking for some great information on how to clean your solar panels, you have found the right place! But first, let’s talk about why solar panel cleaning is so important in the first place. An accumulation of dirt, dust, oil, sap, droppings, and a host of other things will prevent the surface area of your solar panels from producing electrical power. According to a recent study on Google’s campus, your solar power output could be reduced by up to 36% in a year without a system of routine maintenance. To improve (or maintain) solar panel efficiency - the conversion rate that determines how much of the incoming solar energy is converted into electrical power - there’s a few steps you can take which we will discuss here. While we should all remember that the solar panels on our roofs are high-tech pieces of hardware, it is also important to note that the exterior of these panels is strong, tempered glass meant to survive the elements. This durability means that they are also able to withstand scrubbing and water exposure. Although the cleaning process is very simple, how you choose to clean them will depend on your individual situation and how comfortable you are accessing your roof (or wherever you installed your panels). The good news is that if you have a S﻿olar Lease or PPA, it is the duty of the solar company to maintain and clean the panels. This is because they legally own the panels and they are simply leasing the equipment and energy production to you under a contract. However “maintenance” is a loose term contractually, because it will be up to the installer to determine what services are included. It is possible that they won’t consider cleaning to be a required service which could lead to the panels accumulating dirt and grime, potentially reducing your system’s effectiveness and increasing your energy bills. Have a look at your contract or give them a call. If cleaning is part of your agreement, they will have a group of professionals that will be able to safely and effectively clean your panels without you having to lift a finger. 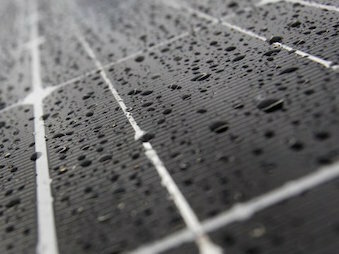 The other good news is that with the help of rainfall, solar panels are generally self-cleaning, so depending on your geographical location, you may not need to worry about cleaning them at all. Note: You should still check occasionally for blockage due to debris. Warning! It's obviously dangerous to be on your roof, so take necessary safety precautions or better yet, hire a professional! 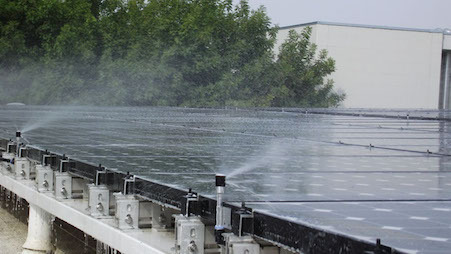 If you own the solar array DIY panel cleaning is the most cost-effective option. You may even have some or all of these materials in your garage already. 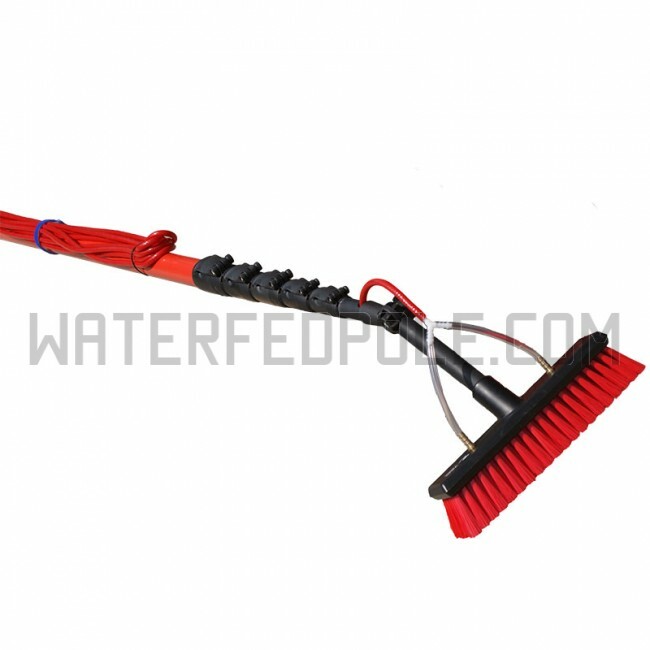 Solar panel cleaning kits typically contain biodegradable soap, a wiper, and a small brush with varying handle lengths. You can go crazy with these (Check out this $279 kit) or find economical options, like this $26 pole extension with a $13 brush. A Water fed pole runs water through the center and can reach 12 feet. These aren't cheap though (basic model we linked to is $152). Solar panel cleaning is not much more complicated or time consuming than cleaning your average window. Just remember that with any DIY project, safety is the number one priority! 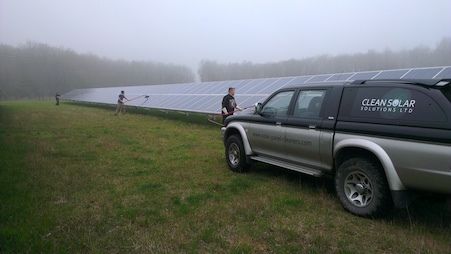 If you do not feel safe accessing your solar panels then leave the cleaning to the professionals. Pro Tip: Always clean your solar panels in the morning or evening. During the middle part of the day the panels can get very hot making cleaning dangerous for both you and the panels. Refer to your manual for instructions prior to shutting down the system and beginning to clean. If you encounter tough spots, never use an abrasive sponge or soap as you run the risk of scratching the glass and decreasing it’s efficiency. If you have mineral-rich hard water, this can leave residue on the glass as it dries. Try to squeegee the panels as well as possible or rinse with captured rainwater if this is your only option. Once you have gathered all the materials you need for the job together, you have to get them up on the roof. Ask a partner to help you by handing items up to you from the ladder. Lay items flat on the roof and make sure they are secure before letting them go. Have your bucket or spray bottle ready with warm water and some biodegradable soap. Pro Tip: Wear shoes with dependable tread to prevent slipping. Take your hose and gently spray down your panels. Spraying the panels will help to remove the top layer of dirt, loosen up the other layers, and cool your panels if you need to place your hands on them during the cleaning. While you are spraying, note any stubborn pieces of debris or dirt that don’t seem to be moved by the water. Common culprits include tree sap and bird droppings. Pro Tip: Never use a pressure washer on solar panels. Although the glass is quite durable, they are not designed to be hit with high-pressure water jets. Use your soapy solution and a long-handled brush, sponge or soft cloth to gently scrub each panel. Be sure to cover the entire surface and especially the corners along the bottom edge – they are the most prone to dirt build-up. 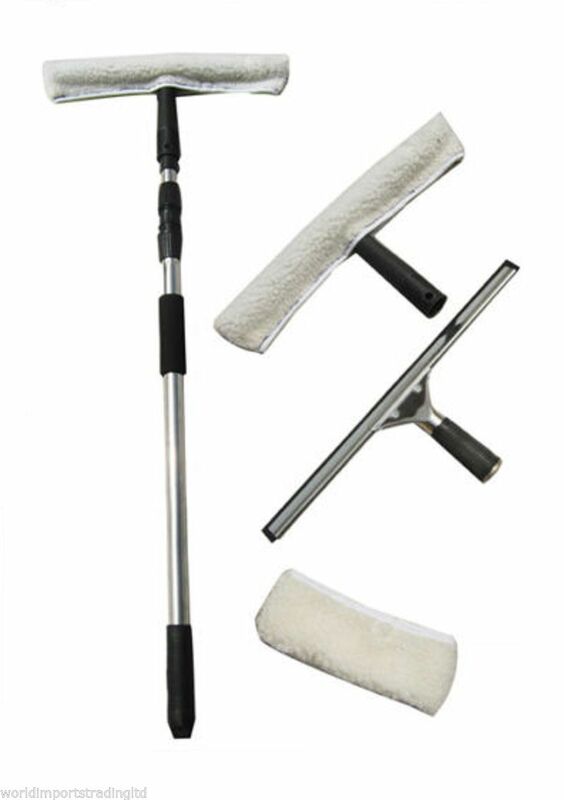 As long as you are using a non-abrasive brush, you will be able to scrub as much as you need to clear the debris. Start from the top of the panels working your way down as you clean. Rinsing off the soap is a step that most home DIY’ers wouldn’t think about too much. While normal hose water will work fine for rinsing the panels, it can also leave bad water spots. Deionizing removes all of the natural minerals from the water. If you have some extra deionized water lying around, it won't hurt to use it for the final rinse. Be sure to squeegee the panels with care from the top of the panels to the bottom to remove excess water. Avoid making contact with the panels with anything other than foam or rubber. After you’ve completed the cleaning, it’s time to get all of your materials back to ground level and mark your calendar for the next cleaning - six months to one year. There are automated systems for many household chores. Whether it’s a vacuum cleaner for your home or an automatic cleaning system for your swimming pool, there’s technology available to help you get most jobs easily done. Now, there are also systems to clean your solar panels! If you live in a remote and dry location, or maybe DIY just isn’t your thing, you may want to consider looking into self-cleaning panels such as those offered by Heliotex Automated Solar Cleaning Systems. These systems are especially handy if you don’t have time to clean your panels yourself by acting as a type of sprinkler system for your panels. For those of you that do not wish to tackle this project on your own, there are many options for hiring a professional cleaning service. 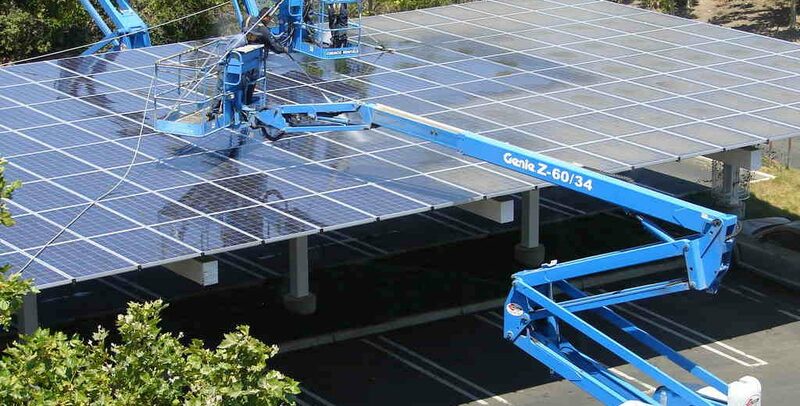 These companies will often set up an annual or biannual service agreement for your solar panel cleaning. Service prices for a professional will vary, and will usually include a base fee, roof access fee, or minimum charge associated with this type of cleaning. Because of these charges the price will typically be well over one hundred dollars for even a small house grid. Hopefully, you have enjoyed this tutorial and also learned the importance of solar panel cleaning. Check out our list of more of the best solar panel cleaning tools and remember even if you live in an area with heavy rainfall to check your panels for dust and debris which could decrease efficiency by up to 50%. If you are still unsure if your panels need cleaning and/or how often they should be cleaned, simply follow our solar panel cleaning guide and monitor the changes in the power output of your solar panels before and after. Alternatively, contact your solar panel manufacturer or installer for their advice.